Imagine receiving a message from your Higher Self via the language of shell! Yes, you can now receive a message by selecting shells from over 200 choices. A reading lasts 30-60 minutes and can be done by email, phone, or Skype. The process is simple and supportive and the message is always one direct from your Higher Self. Shells are crystals found in the watery depths of the planet’s oceans and each one has a message. You will be fascinated by how they choose to speak to you. Through the amazing work of Michelle Hanson of Ocean Oracle, we have learned how to interpret these messages and be their voice. 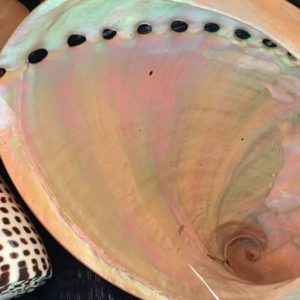 The shells will help you gain insight into your current circumstances, into hidden beliefs that hinder your development, or into circumstances that are troubling you. They are loving emissaries who deliver their message without judgment. They want to speak to you in order to enhance your unfoldment into the being you are meant to be. Home parties available. Inquire for fees and travel expenses.